Every year in the UK, hundreds of workers are killed just doing their jobs, thousands more die of illnesses caused by their work and tens of thousands suffer major injuries such as amputations, loss of sight, serious burns, and so on. Worldwide, two million people are killed by work each year. Yet with the exception of high profile cases such as the gas leak at Bhopal, India, which killed tens of thousands, this crime wave fails to attract the interest of the politicians, the media or - least forgiveably of all - the knowledge industry of criminology. This book is concerned with crimes against worker and public safety, providing an account and analysis of this increasingly important field, and setting this within the broader context of corporate and white-collar crime. It uses case studies and original analyses of official data to illustrate key points and themes, drawing upon both well known and high profile instances of safety crimes as well the mass of ubiquitous 'mundane' or 'routine' deaths and injuries. Thus the book examines how much safety crime is there, how are such offences rendered invisible, and how can their extent be unearthed accurately? Throughout the book the authors analyse the social, legal and political processes that ensure that safety crimes remain subject to under-enforcement and under-criminalisation. This analysis identifies key moments in the historical development of criminal law and regulation, and assesses the prospects for criminalising safety crimes in the context of contemporary neo-liberal regulatory policies. The theoretical and political justifications for dominant approaches to the regulation and sanctioning of safety criminals are subject to critique in order to develop alternative, more effective, means of criminalisation and punishment. 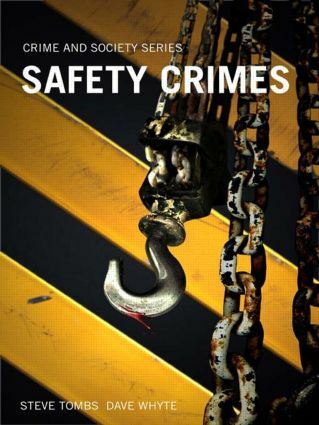 The book concludes with an original analysis of safety crimes that allows us to understand the complexities of the conditions of their production, and develop a more realistic appraisal of the prospects for their amelioration.